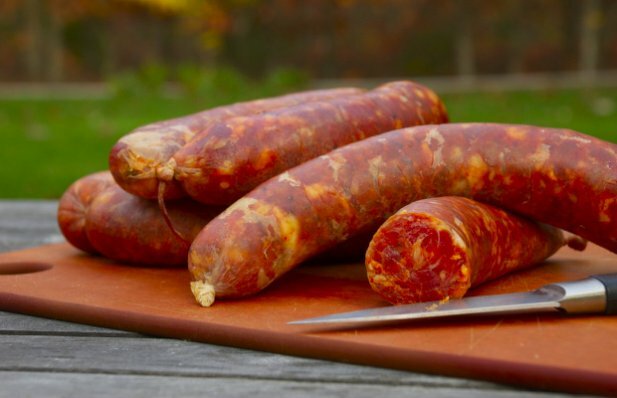 This is a traditional recipe for Portuguese sausage (chouriço), enjoy. Start by trimming most of the fat off the pork. Cut pork into cubes, about 2 inch diameter. Place all the cubed pork, seasonings and wine in a large basin. Try not to break down the bay leaves because they will have to be removed before filling the casting. Mix everything together making sure all the seasoning is evenly throughout the pork. Cover (we use a garbage bag). Place meat in fridge. Mix every 12 hours for 2 days. At every mixing, cook a handful of pork to taste if any more seasoning is needed. Remember when smoking, the pork will lose a lot of flavor. I highly recommend over seasoning. On filling day, rinse each casting a few times. Check for hole or defects. Using baking twine, tie off one end of the casting. Remove all the garlic cloves and bay leaves before filling. Place the open end of the casting on the funnel. while holding the casting onto the funnel, begin to fill casting with cubed pork. Slowly work the meat to the end of the casting. Use a safety pin to pop any air pockets. Tie the other end once it is filled. Place the filled sausages onto your stick without touching, place in smoker, start your fire. Be careful that the flames do not reach the sausage. Remember, low heat for a long period of time. Keep any eye on the fire for flare ups or if fire goes out. After 24 hours, let the fire go out, flip the sausages. Then start the firing process over again. At this point when you flip them, you will need to determine if you are halfway done or if it will take longer than an additional 24 hours. This is tricky, and where experience comes into to play. Smoking for 24 hours on each side is usually the minimum. An additional day or two may be needed. When the sausages are done, place them indoors and let them dry. **If your smoker is like ours, place some sort of gate in front of pit opening. If the fire goes out, animals will come and eat all the hard work you have just put in to it.